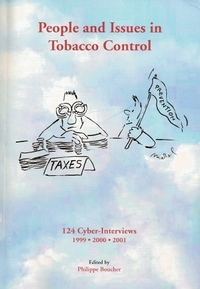 This book puts together presents the first 124 cyberinterviews I produced during 3 years (1999, 2000, 2001) with tobacco control advocates from various parts of the world (24 countries) and from various fields in tobacco control. 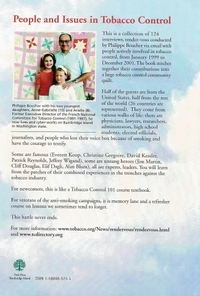 As I wrote on the back cover (click on it to enlarge it and read the text) I considered it a Tobacco Control 101 textbook when it was published in 2002. You can find all those interviews for free on this blog along with many more that took place later but it is a lot of reading on the screen. In any case I hope you'll enjoy the content, on line and/or on paper. Take care. 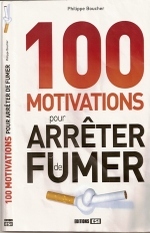 You can order the book directly from me by sending me an email and paying via paypal. 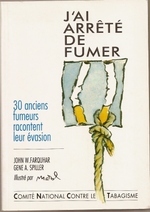 The cost is 40$ (including regular bookrate postage within the US) from me. If you are ordering from far away I'll have to figure out the cost of the postage.